Why are we the best plumbers for Boca Raton? Hands down the Best Plumbing Company in Boca Raton providing residential and commercial services giving the best maintenance and repair services for your drains, showers, toilets, and more. We are a full service company that takes the definition of high quality to another level. Our main concern is to ensure that you are smiling from ear to ear after our plumbing services are completed. Home owners and businesses both depend on our company to get their systems back up and running when it comes to drain cleaning, facet and leak repair, gas / water / sewer line repair, water heaters, inspection & maintenance, water treatment systems, trenchless systems, septic, and commercial plumbing needs. With decades of combined experience, our plumbers take great pride in our years of service and dedication to our skillset. We know that you have your choice of hundreds of plumbers here in this area from Miami-Dade to Palm Beach and Broward. We also know that you want to make sure your family is as safe as possible while a stranger is in your home. One of our biggest compliments from our clients is that they are amazed at how friendly our plumbers are and how easily they get along with their family and pets while servicing their homes. We provide a great service at an affordable price. If you are experiencing issues with your drain and it clogging or just not allowing water to go through, you need to call the professionals here at Best Plumber Roca Baton. We can inspect the issue and tell you what we can do to fix before commencing any work. Our plumbers will hold great communication with you so that we can make this visit as efficient as possible and get you back on track. We can unclog any drain or prevent any stoppage to get your pipes back flowing again. Facet leaking or have another area in your home or business that’s experiencing a leak? What kind of plumbing company would we be if we couldn’t fix a leak? Needless to say, we consider leaks and facets to be one of our specialties. We will get your kitchen back to a leak-free zone! If you have the need to repair under slab leaks, we can handle these, as well. Our state-of-the-art equipment can help detect and test for leaks in any system. The best way to tell that you have a water leak is by paying close attention to your water bill each month. If you notice an increase in your bill unexpectedly, chances are that you have a leak and that you need to call us as soon as possible. A lot of people do not know that we also do gas line repairs, water line repairs, and sewer line repairs for both residential and commercial structures. Our plumbing staff are highly trained professionals that are more than capable of installing or repairing any type of water line while allowing your home or business to operate under its normal conditions with minimal interruption. Water Heaters are another area of expertise from replacement to repair. We can handle all types of water heaters from conventional to tankless and hybrids. We have even worked on solar water heater systems so if you have any questions in regards to, “Can you guys help me?” the answer is most likely, “YES, we can.” When you put your trust into our hands, you know that you are working with the best plumbers in Boca Raton. With our experts working on your situation, we will be able to get you hot water back working as quickly as possible. When it comes to Inspection & Maintenance, it doesn’t get much better than the service we provide. We have been relentless in our attempt to gather customer feedback about our plumbing services. Hearing the good and the bad from our customers are what we need in order to enhance our quality year after year. We have consistently pushed to continue our education and training as we continue our path as a successful business here in Florida. Water Treatment Systems are extremely effective when installed and configured properly. If you are wanting better, cleaner, and safer water, we can provide you with a list of ways and options to step your game up and get the desired quality of water that you desire. Trenchless Systems are a fantastic option for saving your landscape and property with hard surface areas like drive ways, patios, concrete slabs and sidewalks. This is an amazing process that only digs two holes while we preserve everything else on your landscape. The entire purpose here is that this way is much better than the traditional method where mass digging and destruction are the outcome. 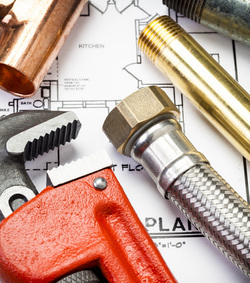 Commercial Plumbing, while an entirely different ballgame in the plumbing world (mainly due to the amount of pipes and equipment), needs to be handled by a professional team of training plumbers and technicians. We believe in providing a superior service and doing it correctly the right way, the first time. Our team has been managing the businesses of Boca Raton, Palm Beach, and Miami-Dade Counties with the latest technology and techniques to ensure that the business owners and employees can operate doing what they do best while we do what we do best. Don’t let your business fall victim to bad pipes, leaking water lines, or clogged drains. We know that keeping up on maintenance and quality of an entire company building can be daunting; take a deep breath and call our staff today and get back to enjoying your life. It is an amazing thing what can be done by fixing a plumbing issue. From water conversation and preservation to lower bills and expanding a company’s budget in other areas. The only negatives that come from hiring a professional plumbing company is trying to figure out what to do with all your extra time and extra money. Stop bringing stress upon yourself for no reason and trying to fix an issue from a How-To YouTube Video. Those videos are helpful but we all know that doing it yourself at home or business isn’t the same as watching it online and in a video. Help make this world a happier place by bringing in a real plumber into your home and fixing your plumbing issues. If your shower, toilet, or facets are acting funny, pick up the phone and give us a shout before it gets worse. The residents of Boca Raton count on us to protect their family from any plumbing disasters and from ridiculously high bills due to leaking pipes or facets. More people depend on us more than any other company in our cozy little area of Florida. Plumbing problems can happen at any time, in any home or business, and without any warning. By contacting professional plumbing services like us, we will be able to inspect and ensure that your structure is sound and safe from any issues. Even if you don’t have any at the moment, try to recall the last time you took a gander at your pipes. Look, we all hate admitting that plumbing disasters can happen. But let us look at this from another perspective: we all drive over bridges every day but how often do we stop our cars, get out, and inspect the bridge before we drive over it? Eventually, bridges will crumble (without proper inspection). Take that same story and let’s change the bridge to your pipes and your car to your house and family. Whether we want to admit it or not, we need to do everything possible to protect our investments and loved ones and the way to do that in the plumbing world, is with proper inspection and regular check ups. There are plenty of small items you can do on your own, without hiring us, to see if anything bad might be happening. If you would like to do what you can on your own, before hiring the professionals, try going to Google and typing in things like Bathroom Plumbing Tips, Kitchen Plumbing Tips, Basement Plumbing Advice, or anything of that nature. If you have a plumbing issue that you do not know how to fix, it is time for you to locate a competent, expert plumber in your area to help you get back to where you were. What better company to choose than a local, hard working, loyal crew based right here in Boca Raton? Along with hiring a local business, you are also helping a small business thrive within the walls of our city. You are supporting your neighbors, your friends, and your family as well as your city. We would like your experience with us to be as pleasant as possible and to have our pricing be as competitive and affordable as we can make it. Chances are that you need your plumbing problem fixed sooner than later so make sure that you choose a plumbing company that puts your problems first, offers solutions, and can accomplish everything within a timely manner.